New images have emerged of a jubilant Kim Jong-un watching on as North Korea launched what it claims is a new type of missile capable of carrying a 'large scale heavy nuclear warhead'. North Korea's leader was pictured smiling and cheering as he personally oversaw the test-launch of the new rocket, believed to be a Hwasong-12, at the weekend. About 30 images of the missile were published by North Korean outlet Rodong Sinmun on Sunday. Kim was said to have hugged officials in the field of rocket research after the launch, saying that they worked hard to achieve a great thing, according to North Korea's official Korean Central News Agency (KCNA). 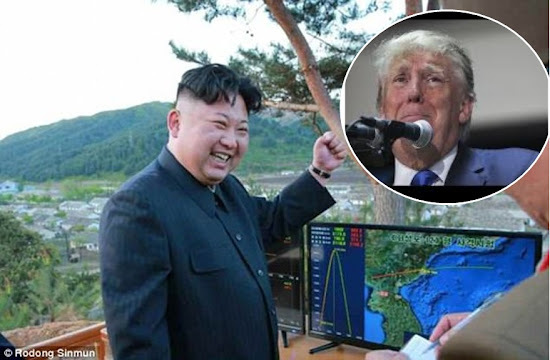 It came as Kim promised more nuclear and missile tests and claimed the United States mainland was within 'sighting range for strike'. The North fired the ballistic missile that landed in the sea near Russia on Sunday in a launch that Washington called a message to South Korea, days after its new president took office pledging to engage Pyongyang in dialogue. 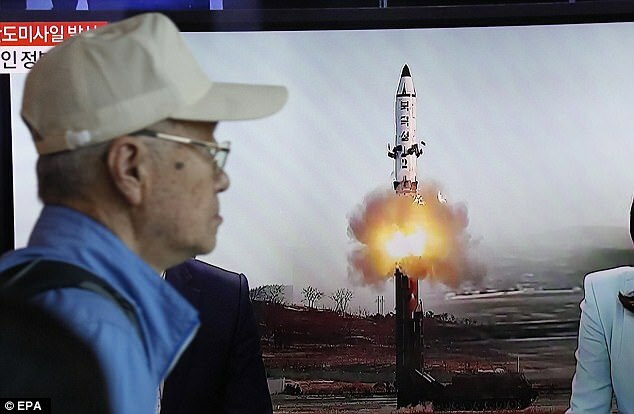 The missile was launched at the highest angle so as not to affect the security of neighbouring countries and flew 490 miles reaching an altitude of 1,312 miles, KCNA said. Experts said the altitude reached by the missile tested on Sunday meant it was launched at a high trajectory, which would limit the lateral distance it travelled. But if it was fired at a standard trajectory, it would have a range of at least 2,500 miles, experts said. 'If the U.S. awkwardly attempts to provoke the DPRK, it will not escape from the biggest disaster in the history, Kim said, strongly warning the U.S. should not to disregard or misjudge the reality that its mainland and Pacific operation region are in the DPRK's sighting range for strike and that it has all powerful means for retaliatory strike,' KCNA said.